It’s one of the most talked about controversies in American sports over the last several years and just when it seems like it could possibly sink to the ocean floor once and for all, it bubbles back up to the surface. This is the cyclical evolution of Colin Kaepernick’s ongoing tiff with the NFL. One second it seems buried, and the next, it’s somehow making national headlines. It’s annoying. But NFL Commissioner Roger Goodell might have ended this controversy once and for all with this comment. America’s getting ready for the Super Bowl this Sunday. That means that the press corps, teams, coaches, fans and NFL executives, all traveled to Atlanta Georgia this week to witness the big game. It’s really just nothing but festivities and press conferences that lead up to Super Bowl Sunday. 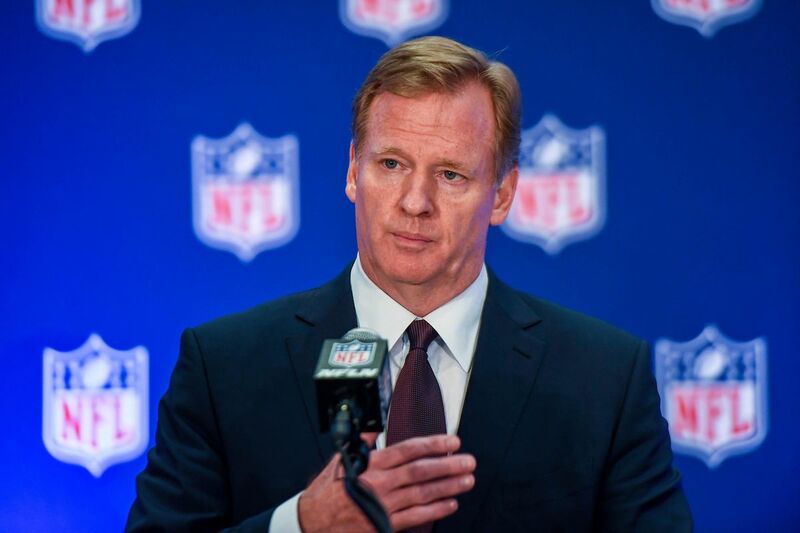 NFL Commissioner Roger Goodell, of course, held a press conference where sports journalists did their best to needle him about the many ongoing controversies that currently surround the league. One of them of course was the NFC championship two Sundays ago when the NFL referees missed one of the biggest no-calls in NFL history with obvious pass interference and helmet-to-helmet penalties. And you know if they’re asked about that, then they obviously were asked about former embattled San Francisco 49ers quarterback Colin Kaepernick and why he was so-called “blackballed” from the league. That’s bad news for Kaepernick. That is like putting an iron train spike through the collusion lawsuit. What the NFL Commissioner did here was insinuate that the anti-American divisive quarterback isn’t currently playing in the league because he’s just not good enough. To make matters worse, Kaepernick’s attorney Mark Geragos appeared on the Today Show following Goodell’s comments on Thursday morning and was distressed over the NFL Commissioner’s comments. Apparently a lot of teams must think so or else they wouldn’t have made that decision. All of this makes you wonder whether he still wants to play football – or whether this is all just a ploy to drum up publicity as being a cultural martyr symbol. Wanting to play and valuing what he thinks he’s worth to a franchise are two separate things. Most teams view him as a backup quarterback that would basically make $2.5 million under the veteran minimum guidelines per the collective bargaining agreement (CBA). But other reports suggest that Kaepernick ultimately wanted starter money in order to join a roster. That’s simply not doable. You can’t afford to pay a backup quarterback the kind of money that he wants because it will affect the team cap space. That’s money you could use to fill out the rest of your roster in areas that are needed. You can’t afford to spend that kind of money on a backup who may or may not play during the regular season. Or, as Goodell says, he’s probably just not good enough to make a roster.